The Michigan cities of Flint and Detroit have several hospitals that perform surgery to help treat epilepsy. Epilepsy is the most common handicap associated with cerebral palsy. In fact, 1/3 of all people with cerebral palsy also have epilepsy. Cerebral palsy is a group of disorders that affect a child’s movement, balance, posture and coordination, and it is caused by an injury to the child’s developing brain. This means that a child can get cerebral palsy up until approximately 3 years of age, although cerebral palsy may not be diagnosed until a child is 4 or 5 years old. Epilepsy is a group of neurological disorders that is characterized by seizures, and it is a long term condition. Seizures are caused by abnormal electrical discharges in the brain, and they can cause a baby or child’s body to go through periods of rapid twitching or jerking, or to experience sustained contractions in the body. There can be many different signs that a child or neonate is having a seizure, but sometimes, seizures can occur with very little or no signs. Epilepsy is not curable, but seizures can be controlled with medication in approximately 70% of cases. It is very important to prevent seizures because seizures can further injure the brain and cause permanent brain damage. The most common method of treating seizure activity in babies and children with epilepsy is to use antiepileptic drug (AED) therapy. Antiepileptic drugs include phenobarbitol, phenytoin and lorazepam. For the 30% of children with epilepsy whose seizures cannot be controlled by medication, brain surgery or implantation of a seizure-prevention device into the brain are the best options for management of the seizures. Hurley Hospital in Flint has several pediatric neurosurgeons who focus on surgery for children who have epilepsy. Henry Ford Hospital in Detroit also has surgeons with the same focus, and in fact, Henry Ford Hospital has been involved in groundbreaking seizure research. In 2013, researchers from Henry Ford Hospital performed a study on epileptic patients who had undergone brain surgery to remove the part of the brain that was causing seizures. The conclusion of the researchers was that 92% of the patients in the study had a favorable outcome, with 82% of patients being seizure free. The subjects in the study each had resective surgery, also called temporal resection, which involves removing the portion of the temporal lobe that is causing the seizure activity. In other cases, physicians may remove portions of the brain outside of the temporal lobes, called extra-temporal surgery. Both types of surgeries have about a 1% chance of causing a stroke or brain hemorrhage (bleeding) that leaves the patient with irreversible brain injury. Last year, Henry Ford Hospital in Detroit was the first hospital in Michigan to offer electrical stimulation of the brain for difficult to treat epilepsy cases. This type of stimulation is provided by a device that is implanted in the patient’s brain, called the NeuroPace Responsive Neurostimulation (RNS) System, which is a newly FDA-approved device. The device is a miniature, implanted computer that detects seizures and delivers electrical pulses to stop them. The RNS system has been shown to provide significant reduction in seizure activity, and it is especially important for people who are unable to undergo surgical treatment of their seizures. Not only does the RNS system help stop seizures, but it also stores a record of the brain’s electrical activity so that the physician can select the best detection and stimulation functions for the patient. Henry Ford’s Comprehensive Epilepsy Center is recognized by the National Association of Epilepsy Centers as being a provider of the more complex forms of intensive brain diagnostic monitoring, as well as a provider of a broad range of surgical procedures for epilepsy, which includes complete evaluations for the surgeries (including implantation of the RNS System). The Comprehensive Epilepsy Center has one of the largest epilepsy programs in the U.S., and surgeons working for the Center perform more than 30 surgical procedures a year for treatment of epileptic seizures. Hypoxic ischemic encephalopathy (HIE) is the most common cause of neonatal seizures. HIE is also a common cause of cerebral palsy, which is why many children with cerebral palsy have epilepsy and seizure disorders. In fact, many of the conditions that damage the brain and cause cerebral palsy can also cause epilepsy and seizures. Neonatal hypoglycemia, intracranial hemorrhages (brain bleeds), infection in the baby’s brain caused by an untreated maternal infection, fetal or neonatal strokes, and hydrocephalus all can cause cerebral palsy, epilepsy and seizure disorders. Indeed, the most prominent feature indicating brain damage in a baby is the occurrence of seizures. Determining the underlying cause of seizures is critical because many times, drugs will not be effective in controlling seizure activity until the underlying cause is treated. Furthermore, the medical team must make every effort to prevent seizures and minimize seizure activity and severity. Not only can brain damage cause seizures, but seizures can cause brain damage. Babies at risk of having seizures and that have had a seizure must be closely monitored. Sometimes the only sign of seizure is activity on an EEG (electroencephalography – brain activity monitoring). Heart / lung monitoring devices may also alert the medical team that the baby is having a seizure. One sign of a seizure is apnea (periods of breathing cessation in the baby), and monitoring devices can detect this. In addition, respiratory rate and heart rate may change during a seizure, which also can be detected on a monitor. Many times, a seizure can be observed. If anyone on the medical team witnesses signs of a seizure, such as the body going limp, the baby losing consciousness, or the baby staring and / or making bicycle “pedaling” movements, EEG monitoring and diagnosis of seizure activity must promptly take place. If a seizure is diagnosed, the underlying cause must be found and timely treated. Very close monitoring must also occur if AED therapy is initiated. This treatment can be dangerous. In addition to standard monitoring, blood levels of the drugs must be monitored, as well as liver and kidney function. Failure to timely diagnose and treat seizure activity is negligence, and this includes failure to treat the seizure’s underlying cause. Failure to properly monitor a baby that is given medication, and failure to properly administer seizure medications can be dangerous and negligent. If this negligence leads to injury in the baby, it is medical malpractice. 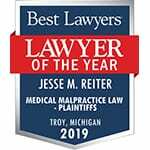 If your newborn or child suffered from seizures and has permanent disabilities, such as cerebral palsy or intellectual disabilities, please contact the nationally recognized birth injury attorneys at Reiter & Walsh ABC Law Centers. For decades, we have been helping families whose children have cerebral palsy and epilepsy / seizure disorders. We have numerous multi-million dollar verdicts and settlements that attest to our success, and we will fight to obtain compensation for the lifelong treatment and therapy that your child needs. Email or call us at 888-419-2229 for a free case evaluation. No fee is ever paid to our firm until we win your case.